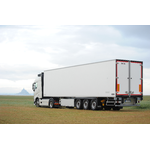 CHEREAU is one of the leading European temperature controlled trucks and trailers manufacturer. We are located in France and offer innovative and bespoke products for all kind of temperature controlled transport. Refrigerated trucks and trailers for all kind of applications.